The "infinity" is another influential symbol in Period 8 because it is actually an elongated "8". Lately, this symbol is used widely in the design of costumes, jewellery and even in property construction because of its luckiness. Almost everyone who has strong links to this symbol will reap benefits from it. Feng Shui master attribute its potency due to the power of "8". In Hong Kong where Feng Shui is widely practised, if you ever open a bank account, one will only receive the account number that ends with the number "8" only for sure. Those wearing or displaying this powerful symbol will have the influence of the period 8 and thus enjoy endless good luck and happiness. 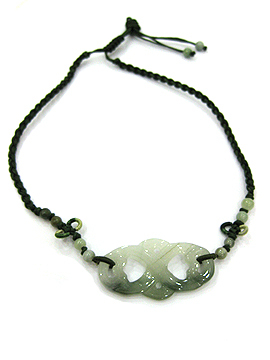 On the other hand, the jade is also a strong representation of earth energy, which synchronizes with the base element of Period 8, thereby making it very powerful. This pendant should be worn to multiply your health luck, wealth luck, relationship luck, love luck and extremely good fortune in all areas of your life throughout the Period 8. The infinity is related to a few possible positive meanings. It could mean "without end", "the largest possible number", "furthest possible distance" or "bigger than the biggest that you can think of". It simply links to "unboundedness" or "no limit". In philosophy, infinity can be attributed to space and time which is very much attached to Feng Shui philosophy as well. Often philosophers link the symbol to "ultimate", "absolute" or even "God". It usually represents a sense of being without any constraint. Chinese have used this symbol abundantly for over 2000 years as in number "8" and it is probably the most wanted number of all. "8" means "fatt" (prosper) in Chinese. It also make up the buddhist mystic knot. Non-buddhist feng shui practitioners normally prefer using the infinity symbol over the actual mystic knot symbol. 1. Wear the infinity knot to invoke undying true love that is everlasting. 2. Wear the infinity knot to bring in good fortune in Period 8. 3. Wear the infinity knot to increase your scholastic luck. 4. Wear the infinity knot to increase your wealth luck. 5. Wear the infinity knot to increase your career luck and let it sustain for 20 years in Period 8. In fact, the presence of the infinity knot will benefit every aspiration of your life.